The Arab media has gone on overdrive to vilify the position that Russia has maintained from day one with regards to Syria. Syria and Russia will go to war, the US is not doing enough to funnel weapons into the area of the Syrian conflict, the US is giving the Russian Federation assignments, Brahimi and Russia intentionally railroaded their own peace plan and finally “Washington has always looked for a political solution… ” These are just some of the false statements that appear in the world’s press with regard to the Syrian conflict, but having them all in one place makes one really wonder who is pulling the strings. 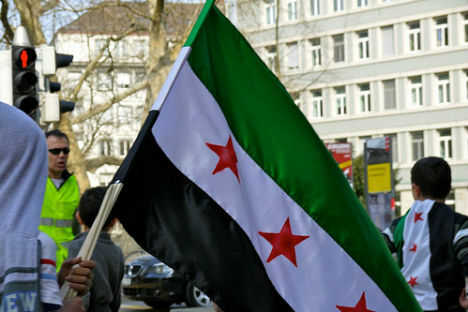 What is intentionally being left out by the West in any debate concerning Syria is the fact that Syria is a sovereign nation and no matter how much one country might not like the leader of any nation and how badly the leader’s removal may be desired, it is, for lack of better phraseology “illegal” to bring about the forceful removal of a leader from the outside and it is also illegal to extra-judicially execute a head of state. Can Syria be a zone of peace in Arab world? The continued vilification of Russia due to the position it has maintained from day one with regards to Syria is so patently transparent and self-serving that one wonders how dumbed down the writers believe the readership must be to be buying into it. A recent article regarding Syria by Abdul Wahab Badrakhan in Al-Arabiya News reflects the blatant bias against Russia and Syria and the adage “if you repeat a lie long enough it becomes true”, but what makes the work in question stand out other than the Fox News style of repeating mindless talking points, is the fact that it chides the US for not doing enough and attempts to portray some sort of conspiracy between Russia and the US. The Western reaction to a recent speech by Bashsar Assad was also indicative of the policy that the West is maintaining, namely if something does not fit into their pre-planned scenario, it has to be vilified. The Clinton State Department either did not actually listen to Assad’s speech or chose to ignore all of the points made by Assad. The statement released after Assad’s speech is what we have heard all along: "… another attempt by the regime to cling to power and does nothing to advance the Syrian people's goal of a political transition… His initiative is detached from reality, undermines the efforts of Joint Special Representative Lakhdar Brahimi …” and of course the ever repeated calls for Assad to step down. Back to the previous article in question by Badrakhan who would appear to be a serious expert on Lebanon and the Arab World, writes some things that seem at odds with reality and like empty talking points when it comes to Syria. He states that Russia which has promoted a political solution to the crisis from the beginning and Lakhdar Brahimi deliberately caused such a solution to fail. He also says that Russia and the US have some sort of secret agreement, which might be indicative of the real Arab attitude to the US, which has long believed the Arab World is supportive of their geopolitical plans for the entire Arab World. “The Americans are clear about their willingness to dismantle any situation that might drag them later into direct intervention.” This statement is so patently false as to be laughable for anyone who has even briefly followed US war policies over the last several decades. The US quite frankly, does the opposite as it has been doing in Syria, perpetually looking for a pretext to invade. “The regime got the message that it’s free to use the chemical weapons within specified geographical limitations…” There is no evidence that Assad or anyone in the government has ordered or allowed the use of any form of chemical weapons whatsoever. “It seems now that the promises of the U.S. to the Syrian opposition, that it can count on U.S. financial and armed support… were merely words.” Amid constant reports of mercenaries and western backed foreign fighters in Syria this statement seems ridiculous. The writer also takes no issue with the fact that funding an armed opposition to over-throw a government by force is not in keeping with internationally accepted norms. “Washington had always looked for a political solution, with an ideal scenario consisting of keeping the “acceptable” part of the regime and the immediate departure of Bashar Al-Assad, as it just cannot deal with him”, another completely false statement and the unbelievable arrogance in saying “Assad must go because the US “just cannot deal with him” is stunning. “… the U.S. commissioned the Russians with the assignment, so they can deal with their favorable regime.” Apparently the writer believes that the Russian Federation which is one of the few countries in the world with a robust and independent foreign policy is another lap-dog for the US. The writer then continues to demonize Russia for attempting to mediate a peaceful resolution to the crisis by saying things like: “Moscow sends an invitation to the opposition coalition to visit the Russian city for dialogue. What dialogue? With who? How will it be discussed? According to which agenda and upon which conditions?” Maybe he should answer these questions before demonising Russia for attempting to hold talks. And he says:”…. not offering them more than a chair at the negotiation table…” We are talking about armed insurgents and terrorist groups attempting to overthrow a legitimate government by force, they should be grateful that they are allowed a seat. “In the imminent days, the regime will battle with Russia, which supports its reliance on Iran’s and Hezbollah’s experience…” I have no idea where he got such information but Russia and the “regime” have had and continue to have a normal relationship. “And while the opposition was waiting to be supplied with advanced weapons…” The writer contradicts his own statement made above. If this is the Arab position then what we can see is that they want more bloodshed and more weapons and money to be flowing into Syria so that the endless cycle of violence continues. If we take into account the Sunni-Alawite animosity then the reason for this is understandable, but to vilify and twist the facts in an already muddled situation, in reality, helps no one.